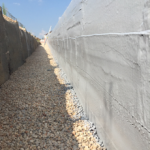 This structure is a new concrete tunnel, 718’x25,’ that was built to help keep traffic moving on MoPac in Austin, TX as part of the MoPac Improvement Project. The tunnel was water blasted with a 5000psi water blaster over the course of a couple of weeks due to the extreme amount of rainfall. Finally, the forecast looked promising the week of June 7, 2016. On the night of June 7, 2016, LCR started priming the sides of the tunnel with Raven 162, two-component epoxy primer. 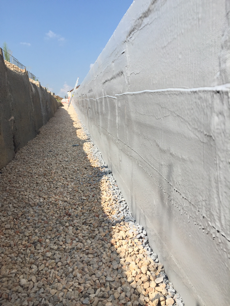 LCR applied two coats of the primer to help reduce the outgassing of the concrete tunnel. At approximately 1AM on the 7th of June 2016, LCR started to apply the Raven 512 100% solids polyurea on the sides of the tunnel. 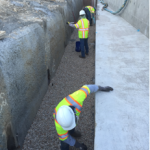 They applied the 512 at 120 to 130mils thick, incorporating 12oz Geotextile fabric to cover the construction joints. The following night, LCR started the same process to the top of the tunnel. This project concluded on the June 11, 2016. The total number of days it took to complete this project was 4 days. The overall condition of the structure was new concrete as a cast-in-place design. There were very few defects throughout the structure besides normal construction defects. Visual Inspection, Wet Film Thickness test, and pull off adhesion test were completed. Weather was the most challenging portion of this project as heavy rains flooded the areas. 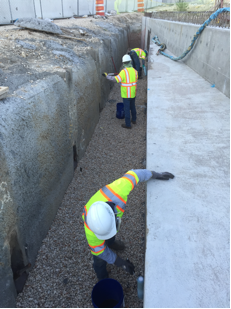 Traffic control was already in place and overcoming the use of polyurea and Geotextile fabric to allow movement in the construction joint was a learning lesson. The new toll lane will expedite traffic in and out of Downtown Austin via toll way.